Karen Carlson is back on the playground at Jackson Elementary School, this time with a whistle. Carlson, who was hired last October as an instructional aide, has many connections to Jackson. She attended the school for grades one through four in the 1980s, has three children who went there (including two right now), and currently lives right across the street from the school. Life has been an interesting cycle for Carlson, who has lived in many places, including Chicago and Atlanta, since graduating from West Bend West High School in 1994. “Strange how life sometimes brings you right back to where you started,” she said. Her job consists of language arts support for first, third and fourth graders. She also supervises recess. 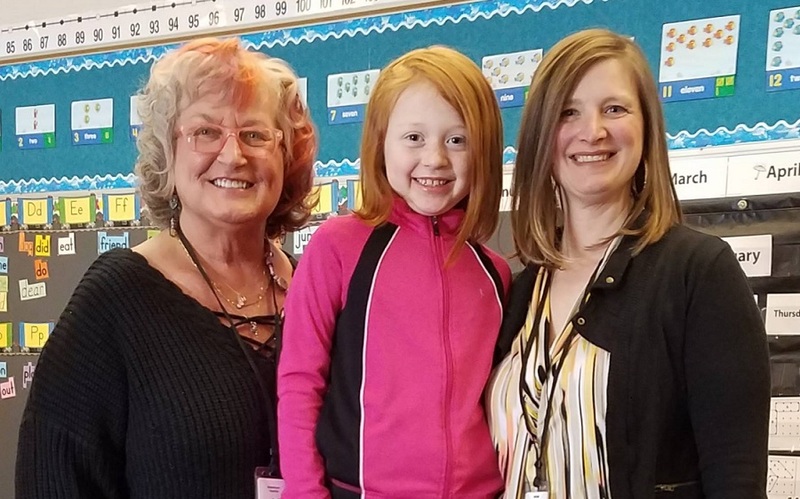 Carlson’s youngest daughter, Evelyn, is a first grader at Jackson and last month had a substitute teacher that surprisingly turned out to be a familiar face. The sub, Mary Mayer, was actually Carlson’s first grade teacher more than 35 years ago. That wasn’t the first time that Carlson was able to reconnect with Mayer. They also crossed paths one summer when Carlson was helping out with summer school at Green Tree Elementary School, and she was placed in Mayer’s classroom. Carlson says that Mayer was her favorite teacher at Jackson, and remembers her being colorful and larger than life, always providing a safe and joyful classroom. “I feel like I can see her reading a story to us, completely animated and putting her whole self into that book so that we, her students, would learn to love books as much as she did,” Carlson said. She also fondly recalls Ms. Curly, who helped third graders practice spelling words by holding contests. Her favorite subject, though, was physical education. Carlson had lots of energy and would run into class with fierce determination. Carlson is now raising three girls to have that same determination. Fourth grader Eleanor, like Evelyn, attends Jackson. Adelaine is a sixth grader at Silverbrook Intermediate School. The echoes between Carlson’s past and present often make her think about what it all means. “I never thought, when I was playing on the playground here, at Jackson Elementary, that one day, as an adult, this little street, in this little village, would one day make me ponder life’s existential questions,” she said.